PN responses to odors are highly dynamic. From Laurent, et al (1996). After a few minor papers, the Laurent lab began cooking in the mid-90s when they recorded extra- and intracellularly from neurons in the AL and MB while presenting locusts with odors. They noted two things: that the LFP oscillates at 20Hz in both the AL and the MB; and that PNs fire action potentials in response to odors not tonically, but dynamically, with periods of excitation and inhibition (see right; Laurent and Davidowitz, 1994; Laurent et. al. 1996). Around 10% of PNs responded to any given odor, showing that PNs had an odor receptive field. The PNs' responses were reliable: repeated odor presentations separated minutes would elicit the same response. They furthermore discovered that the intracellular responses were correlated with the LFP. The Vm of LNs oscillated in near synchrony with the LFP; in contrast, PNs depolarized around 1/4 cycle after the LNs. 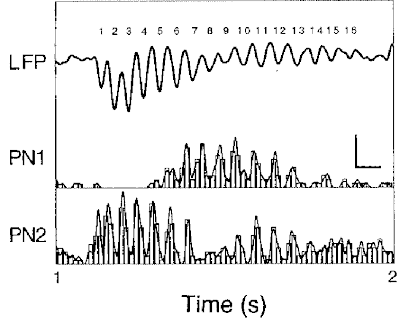 When PNs fired action potentials during odor presentation, some of these action potentials were synchronized with LFP, occurring during the rising phase; at other times, the action potentials would fire unphased (see below; PN2 is phased during the early cycles, and unphased for cycles 14-16). When PNs fired in sync with the LFP, the phase of the action potentials was the same for all PNs and all odors, which means that action potential phase does not encode odor identity, but merely the action potential timing (Wehr and Laurent, 1996). By looking at the phase, they found that while PN responses are reliable on a long time scale, on a cycle-by-cycle basis, they are only 20-90% reliable. PN action potentials are synchronized with the LFP. Top: LFP trace, with labeled cycles. Bottom: PSTH from two PNs. Both PNs fire APs at the same phase. From Wehr and Laurent (1996). Given that neurons fire dynamically, and in sync with the LFP, they next asked whether the firing between neurons was correlated. To look at this, they simply calculated the cross-correlation of the membrane potential between two neurons over time. They found that pairs of projection neurons would become transiently correlated for periods of a few hundred milliseconds. Cross-correlation between pairs of neurons. The odor was presented for 1s (see bar left), and different pairs of neurons were correlated at different times following the odor. From Laurent and Davidowitz (1996). As mentioned before, the phase of LNs' voltage preceded that of PNs by 1/4 cycle. To better understand the relationship between LNs and PNs, they recorded intracellularly from LN-PN pairs, and found that depolarizing current injection in LNs could hyperpolarize PNs. This explains why LNs phase precedes PNs: PNs need to be released from inhibition before firing. LNs are GABAergic, so to see how LNs affect PN responses to odor, they bathed the antennal lobe in picrotoxin, a GABAA inhibitor. Picrotoxin reduced the 20Hz oscillations in the LFP, but did not effect the response of PNs. Obviously, since the LFP was reduced, the PNs' action potentials were no longer correlated with the LFP. Picrotoxin abolishes 20Hz oscillations in response to odor, but not PN action potentials. Top: LFP; middle: PN voltage; bottom: PN-LFP cross-correlation. Left: This PN fires action potentials in response to odor, in sync with the LFP. Right: Following picrotoxin, the neuron still fires action potentials at the same time, but no longer in sync with the LFP. From Macleod and Laurent (1996). I'm going to stop here for now. 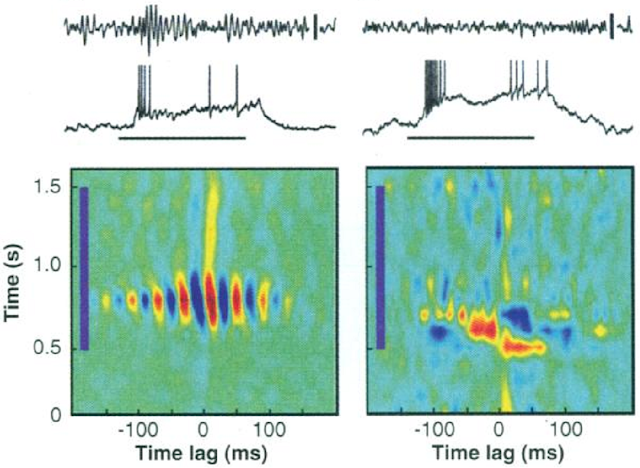 In these four papers from 1994-1996, Laurent and colleagues showed that there are 20Hz LFP oscillations during odor presentation, and that the projection neurons fire action potentials in dynamic groups of neurons. 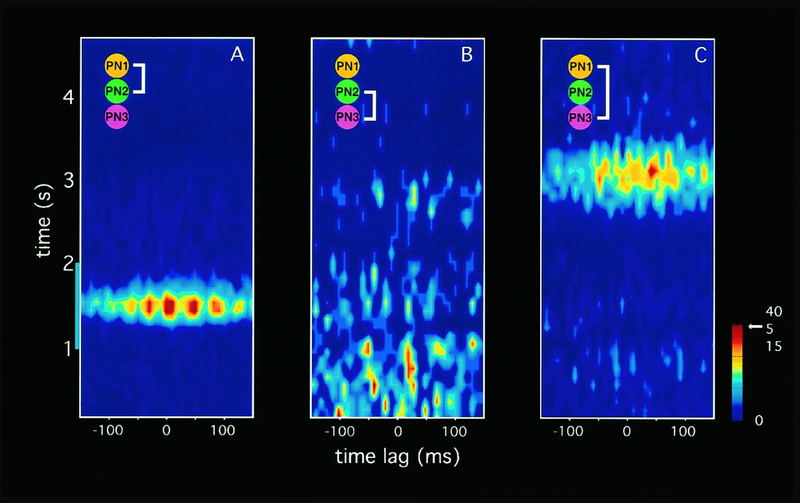 Using pharmacology they found that the 20Hz oscillations are generated by local neurons, but that projection neurons still respond to odors absent the synchronizing oscillations. These papers from the 90s put in stark relief how much neuroscience has changed. The papers are much shorter. For this post I read five papers that included 28 figures combined, with zero supplemental data. In comparison, when I did retrospectives on the Carlson lab or Katz lab, I could base a post around two papers from the aughts, since each paper contained more experiments. This is not an indictment of Laurent, but rather a comment on changing standards. Another aspect of the different standards is that these papers were more descriptive and less quantitative that contemporary papers. They were able to state things like, "The temporal structure of the response of individual PNs to a given odor was consistent and reliable," (Laurent, et. al., 1996, p.3839) without actually quantifying how reliable each cell was (these techniques, or the computer power to employ them, may not have been widely available, and indeed the Laurent lab eventually developed many of them). This descriptive nature makes the papers feel much less formal, almost like a series of long, thought-out blog posts, each an incomplete fragment of a story. Only the last paper, Macleod and Laurent, feels like a completely new set of experiments that set out to test the system. Next time I'll cover papers from 1999-2004, which use more varied model organisms and stimulus protocols to explore the dynamics of the response.